Analog Devices' Digital Potentiometers Enable New Level of Precision Calibration in Industrial Systems : ADI's AD529x digiPot ICs deliver 20 times better resistor tolerance than competing devices, allowing designers to improve system control by setting more accurate amplifier gain ranges. Analog Devices, Inc. (ADI), a world leader in semiconductors for signal processing applications, today introduced a digital potentiometer (digiPot) family with the industry’s best resistor tolerance, allowing designers of industrial and instrumentation equipment to meet tighter resistor matching requirements for improved system accuracy. In industrial control systems, medical instrumentation, and other devices that require finely tuned gain and offset control, power supply calibration or volume control, the tighter resistor matching provided by the new digiPots allows engineers to set the range with greater accuracy, resulting in more precise system controls. Designed for open-loop applications and systems that demand precision calibration and tolerance matching, the AD529x family consists of three single-channel, 10-bit programmable digiPots featuring less than one percent end-to-end resistor tolerance (RTol) error over a wide ±15-V supply range—20 times better than competing digiPots, which specify a minimum RTol error of 20 percent. The best-in-class resistor matching of the AD529x family allow users to take full advantage of up to 1024 tap adjustments to more precisely adjust and trim electronic circuits for improved overall system performance. The AD529x family is manufactured on Analog Devices iCMOS® (industrial CMOS) modular manufacturing process, which combines high-voltage CMOS and bipolar technologies to enable the device to support dual power supplies in the ±10.5-V to ±15-V range and single supply operation in the 21-V to 30-V range. The 1024-tap AD5292 and pin-compatible, 256-tap AD5291 digiPot feature a 20-times-programmable memory. The wiper setting of these two devices is controlled through an SPI (serial peripheral interface)-compatible port. An internal fuse is blown to permanently save the wiper position. Triggered by a simple software command, no external power supply is required to program the device, saving cost and PCB area. 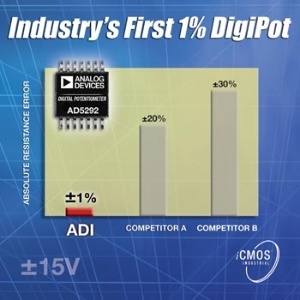 The 1024-tap AD5293 digiPot also features less then one percent resistor tolerance (RTol) error and wide supply range but with volatile memory. The AD529x digiPot family is available now in sample quantities and comes in a 14-lead TSSOP (think-shrink, small-outline package). In 1,000-unit quantities, the AD5291 is priced at $2.29 per unit, the AD5292 is priced at $2.62 and the AD5293 is priced at $2.55. For more information, visit http://www.analog.com/pr/AD529x. iCMOS is a registered trademark of Analog Devices, Inc.